Happy Monday! I hope you had a wonderful weekend! 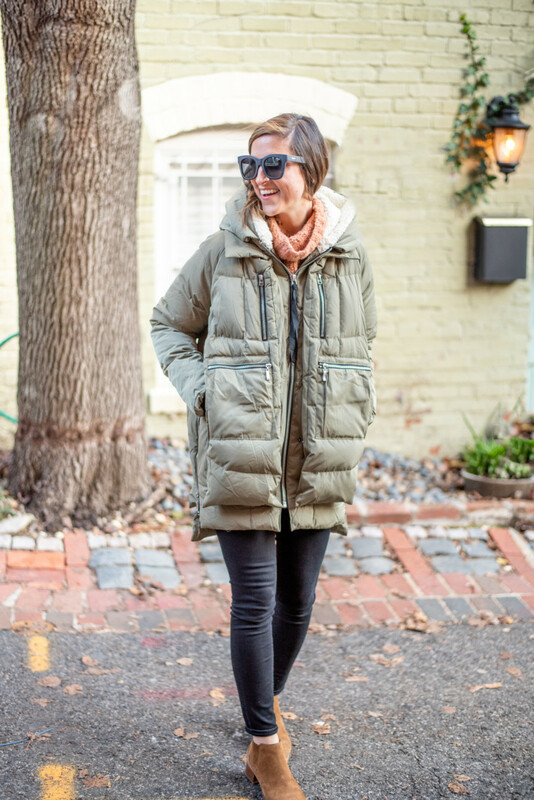 Today I’m sharing a look at what essentially amounts to my winter uniform. 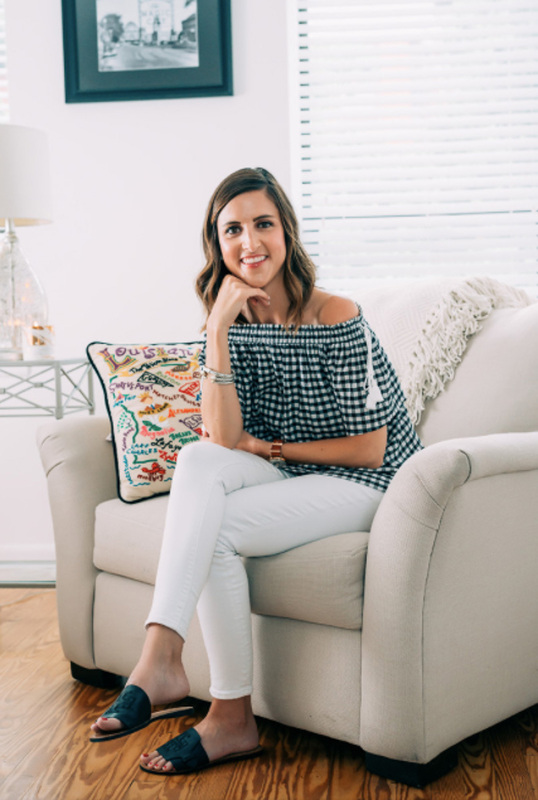 The staples I can’t stop wearing and keep grabbing from my closet over and over again! 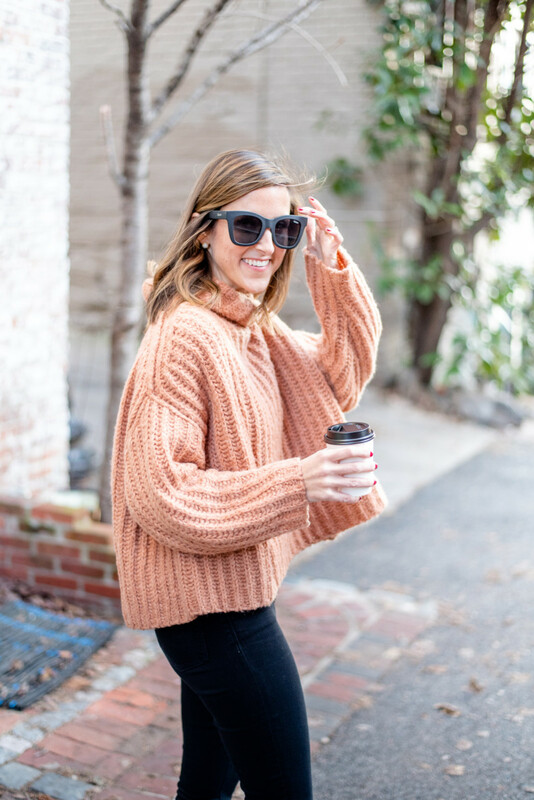 Plus sharing a bit of a life update to keep you in the loop on what to expect here on the blog over the next two weeks! I’ve had this pair of Madewell jeans for several years now, and I still love them just as much as when I bought them! They’ve held their black color so well, and I find that Madewell jeans keep their shape so well even through multiple wears without washing! 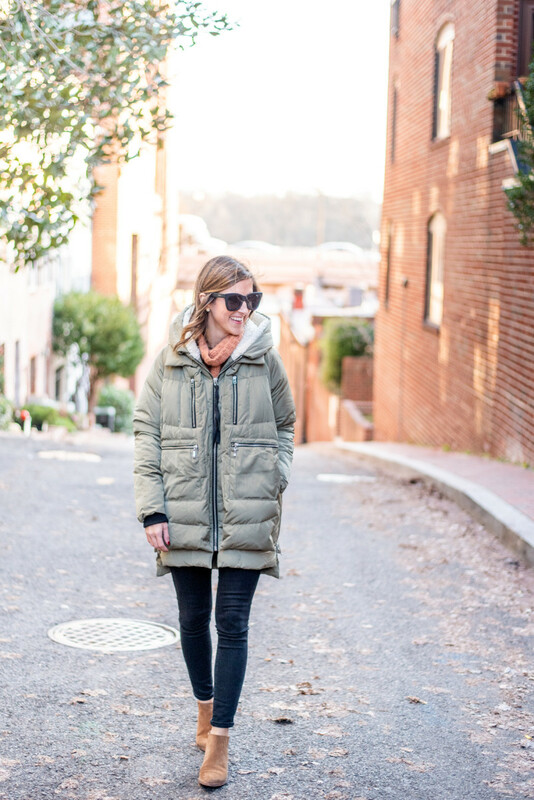 I always size down in Madewell jeans and either opt for the 9 inch or 10 inch rise. I snagged this Free People sweater from a local boutique, LUNA, before the holidays and haven’t stopped wearing it since! It’s stocked in all sizes here! I love that it’s cropped a bit but still oversized and cozy. I’m wearing a XS. 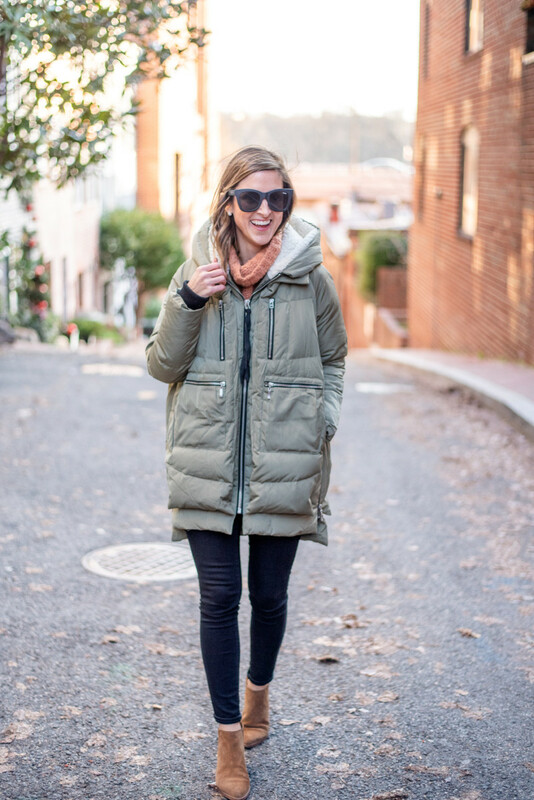 If you follow along with me on Instagram, you’ve seen me wear this ammmmmmazing puffer coat over and over. I legit wear it almost every day of the week. It has replaced my long puffer coat from Uniqlo. I hit the jackpot with this jacket when I came across it a few months ago thanks to seeing it on Bridget’s Instagram Story. It’s from Amazon and such AMAZING quality! It’s $120 and worth every penny. 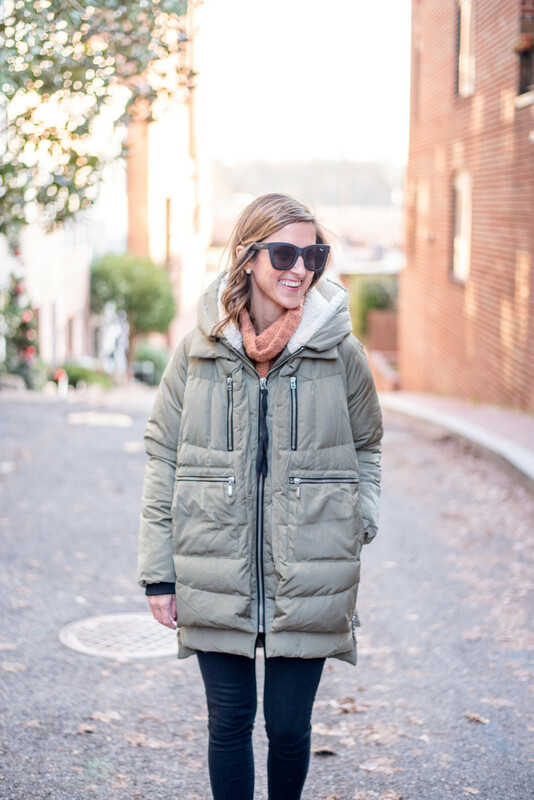 A few features I love about it … It’s super warm, has SIX front pockets, expandable zippers on each side to open up if you’re super layered up, and I love the cozy, sherpa lined hood! It’s available in a few different colors. I opted for the green. I’m wearing a XS. As promised, a little life update … Michael and I are heading to the Bahamas tomorrow for our wedding week/weekend! We’ll be in the Bahamas for a few days, back to DC for 24 hours, and then flying out to Hawaii for our honeymoon (we have a 24 hour layover in LA on our way)! With that said, my posting schedule may be a little out of whack. 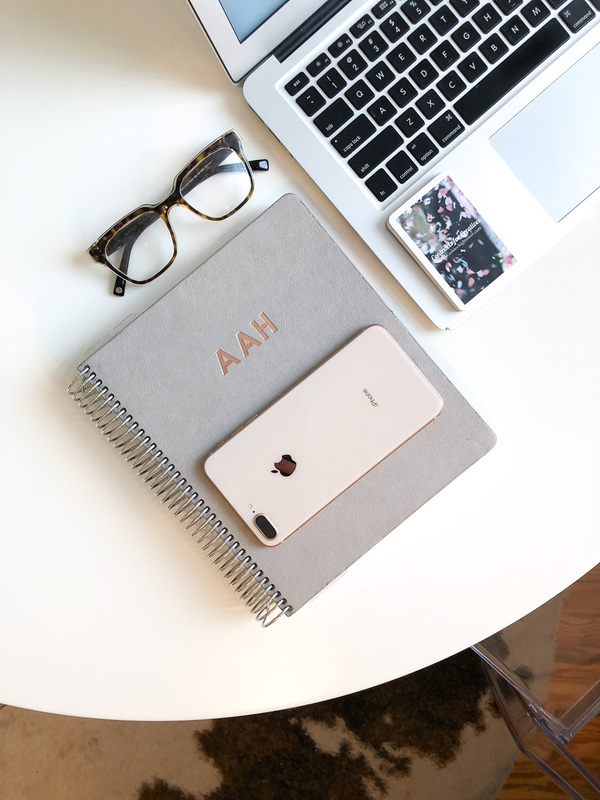 You may have noticed, but since the beginning of the year, I’ve been sticking to publishing posts on Monday, Wednesday, and Friday here on the blog as opposed to my usual Monday, Tuesday, Wednesday, Friday posting schedule. I’m sticking with the three-days-a-week posting schedule through the end of the month. I have some great content planned for the next few weeks to share with y’all! Be sure to follow along on Instagram Stories where I’ll be posting daily per usual! I’m also really excited to share a few big (and fun!) updates with you in February once I get back from our travels! And excited to get back to regularly scheduled programing of posting four times a week!